BCM Institute’s crisis communication certification courses are internationally recognised and are the latest in its suite of courses. 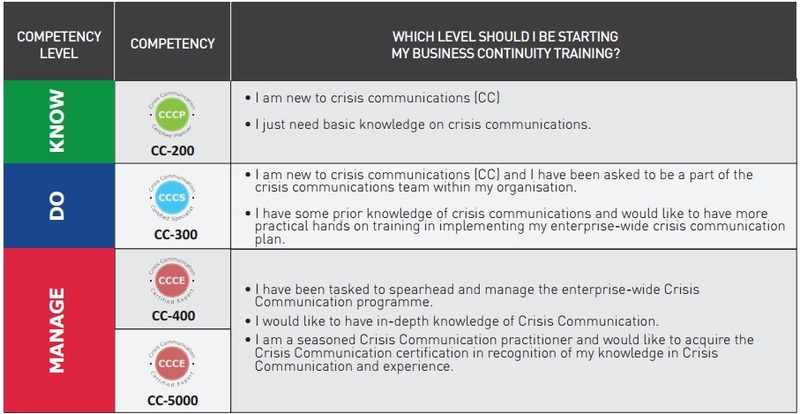 The crisis communication courses offered are unique in that it provides training to business continuity (BCM), crisis management (CM) and IT DR practitioners with the relevant skill sets required to assist and support their corporate communication or public relations teammates during a crisis. It provides them with the relevant tools to understand their position as a BCM, CM or IT DRP and the relevant information that is needed for the crisis communication team. Our courses are structured such that any practitioner can advance in their crisis communication competency and at the same time acquire the right level of certification systematically. Each level of competency allows one to acquire the knowledge and competency needed in his/her job scope. There is also an express track course that allows one to acquire all these in 1 sitting. The express track course, also known as the CC-5000 Crisis Communication Expert Implementer course is most suitable for recently appointed business continuity management (BCM) organisation coordinator with the responsibility to assist the corporate communications team. The same course is also well suited for seasoned BCM practitioners who would like to get their experience in handling crisis communication certified. Alternatively, for practitioners who are business unit coordinators, they could look forward to the 2 Day CC-300 Crisis Communication Implementer course which allows them to have the fundamentals of crisis communication as well as be exposed to the basics of formulating a crisis communication plan. They could also look forward to upgrading their knowledge to go on and attend the *2 Day CC-400 Crisis Communication Manager course where the intricacies of managing and maintaining a crisis communication plan as part of their role in BCM, CM and IT DRP would be discussed. *The pre-requisite of the 2 Day CC-400 Crisis Communication Manager course is the 2 Day CC-300 Crisis Communication Implementer course.